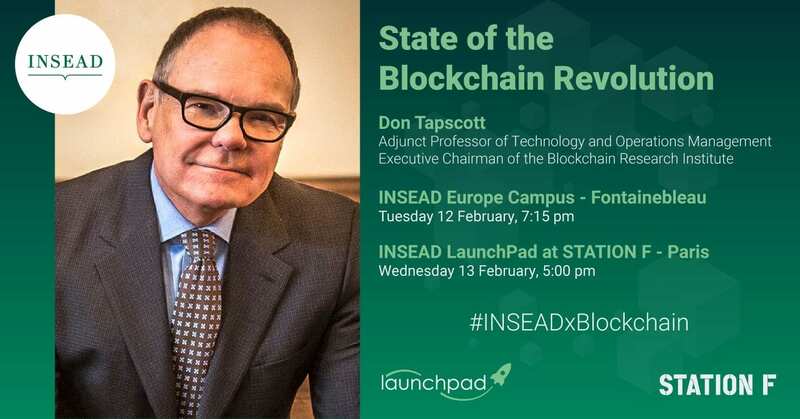 We invite you to join us on INSEAD Campus on Tuesday, 12 February and at Station F on Wednesday, 13 February for presentations by Don Tapscott, INSEAD Adjunct Professor of Technology and Operations Management and Co-founder and Executive Chairman of the Blockchain Research Institute. Mr. Tapscott will present how the technology behind Bitcoin is changing money and business, and shaping our future. Blockchain is to be one of the most transformative technologies of the 21st century. It is changing business, money and the Internet. It holds great potential to reinvent governance at a global scale. In line with our mission to prepare aspiring and current business leaders to navigate the fundamental restructuring of a core part of the economy and society, INSEAD has partnered with the Blockchain Research Institute. Together, we will explore the role and impact of blockchain on industry, organisation, competitiveness, management and governance. We will also examine how it can reshape the rules and principles that underpin our economies. By engaging with not-for-profit, public and private stakeholders, we can ensure blockchain is used responsibly and remains a transparent, immutable and distributed ledger that benefits all – not just a privileged few at the cost of others. As co-author of the best-selling book, The Blockchain Revolution, Mr. Tapscott is a thought leader on this exciting technology. He is ranked #1 Digital Thinker in the world and the #2 most influential Management Thinker by Thinkers50. To register for the 13 February event at Station F in Paris, click here.